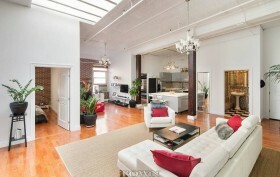 Here’s a gorgeous, fully renovated loft at 88 Crosby Street in Soho. This top-floor space features exposed brick walls, exposed beams, high tin ceilings, hardwood floors, and even a skylight. The bright decor–which includes plenty of potted plants, hot pink sofas, and an umbrella mosaic above the bed–makes this the perfect summer escape. It’s been on the rental market since 2009 with what looks like one-year leases. And it’s available now for $8,500 a month.